On our first full day in Paris our first object was to get a cup of coffee. Hotel Dieu offers room service at 8 Euros per person, but we thought that was a bit pricey for espresso and a croissant. We decided instead to find the cafeteria ourselves. It was one floor below where we normally would exit the elevator, and it was small. Cozy to put it nicely. I ordered deux cafés et deux pain du chocolate. Hey, we were in France I wanted to take advantage of consuming as much fabulous pastries as possible. I forget the amount, but it was about four or five Euros. Far less than what we would have paid for having it brought to our room. I prefer regular coffee to concentrated industrial strength shots of espresso. Later, I discovered if I ordered café au lait that I would get the volume and dilution I desired. Of course that was done with merely adding milk to it. The chocolate laced croissant was wonderful. In fact, I do not think I had a bad croissant anywhere in France. C’est manifique. Then we set off. We walked outside and were giddy to see once again Notre Dame Cathedral greeting us. I had a few guide books of walking tours of Paris and so I knew to look for certain things that I would not have otherwise known. One was Number 10 Rue Chanoinesse where the famous couple Heloise and Abelard met and became lovers. Abelard had been her tutor and after it was discovered that she was pregnant, her uncle was none too pleased. He hired some men to teach Abelard a lesson and in the process he was castrated. Heloise entered a convent, Abelard a monestary, but they continued to write letters to one another for years. I will quote a small passage from a letter Heloise wrote to Abelard. God knows I never sought anything in you except yourself; I wanted simply you, nothing of yours. I looked for no marriage-bond, no marriage portion, and it was not my own pleasures and wishes I sought to gratify, as you well know, but yours. The name of wife may seem more sacred or more binding, but sweeter for me will always be the word mistress, or, if you will permit me, that of concubine or whore....God is my witness that if Augustus, Emperor of the whole world, thought fit to honour me with marriage and conferred all the earth on me to possess forever, it would be dearer and more honourable to me to be called not his Empress but your whore. -- From The Voice of the Middle Ages: in personal letters 1100-1500 edited by Catherine Moriarty, Peter Bedrick Books, 1989, page 166. That was not something I expected to be written by a woman who took the veil. With passion like that, no wonder their love letters are still read to this day. After taking that small detour, we continued on our way by walking over a bridge to the neighboring island of Isle Saint Louis. It is a small island which has a street that goes on its perimeter, one down it center, and others that bisect it. We walked down the center of the island looking at the various shops and restaurants just to get a sense of what was in the neighborhood of where we were staying. We then crossed a bridge to the Left bank and had to stop to take a picture of Notre Dame from a distance. Our first stop was the Institut du Monde Arabe. It is one of the many museums covered by the Paris Museum Pass which you can purchase for two days, four days, or six days. They must be consecutive days. I had at first thought of going to see the Conciergie on Monday afternoon until I realized that if we bought our pass on Monday that would not cover what we planned on seeing Friday. So, we waited until Tuesday morning to buy our four day Museum pass. Negotiating our purchase of the passes and assuring the woman that we wanted to see the special exhibit was difficult enough for us to manage using only French. I did not try to ask if they had any English speaking tour guides. I wanted one, but felt a little intimidated. I wanted to appear as if I belonged, and did not want to stand out like a sore thumb as an American tourist. Even though I was one. Furûsiyya: Chevaliers en Pays d’Islam – Collection de la Furûsiyya Art Foundation. We walked downstairs and saw magnificent examples of weapons and armor with fine artistic detail. The image they chose to adorn their program is of a warrior's mask. 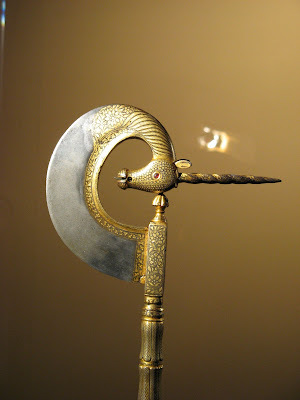 The exhibit included jewel encrusted daggers, ornately decorated shields, intricately carved ivory horns, as well as archers rings. As we entered we not only saw the incredible art, but a camera crew. They were setting up and were soon began filming interviews. We had to watch where we walked for fear of tripping over electrical cords. My husband was afraid to take out our camera for fear that museums did not want pictures taken of special collections. Since we were surrounded by a camera crew, it was not the time when we could simply blend in. In fact, the film crew would have probably preferred not to have any people milling about in the background and we did not want to give them any excuse to kick us out. We were not sure if they were from a television station or if there was a documentary being filmed. Either way, rather than push the issue of whether or not we could take pictures, I settled for holding on tightly to the program and bought a book about the collection. We did however, sneak two photos from the exhibit. 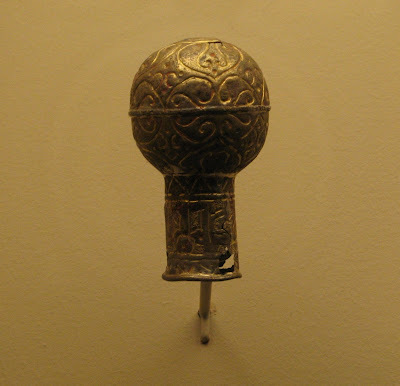 Most of the artifacts were from past the time period for my novel which is at the beginning of the ninth century. However, since about half of my characters are from North Africa, it is important that I try and get a sense of their world as well as that of the Franks. Later we went to see the regular exhibits of the museum and had to take the elevator upstairs. The building itself is a marvel of glass and steel. Trying to walk up the stairs can give you a strange sense of vertigo due to the monochromatic look. One exterior wall is filled with a series of apertures that vary in size and are regulated by motors. My husband is an engineer and he was fascinated by this. Here is an image of one large panel. Here is a close up of one aperture. The full impact of these panels can only be appreciated from the outside. My husband thinks that it resembles a Persian rug. The beauty of the building is matched by the beauty of the artwork and artifacts from all over the Islamic world. There are examples from Africa, the Arabian peninsula, as well as parts of Asia. There was pottery, sculpture, mosaics, jewelry, and rugs. 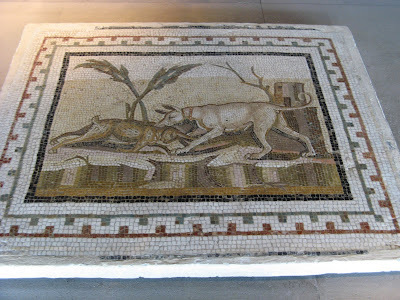 Both the mosaic and the statue of Eros were from Tunisia in the 2nd century AD. Clearly the Roman influence was felt in North Africa as it was in Gaul. Too soon we had to leave because we were hungry for lunch, and we had many more sights to be seen that day. If there are any readers in France who will be in Paris before this Sunday, I urge you to go see this special exhibit before it ends. Next time, I'll show you sights from the Musée Carnavalet. I'm green with envy. Your trip sounds wonderful. I see that you found time to pose for a photo with Tess Gerritsen's book. It's on her website today. Thank you for the head's up. I think I had read her blog when it first posted and it didn't have the photo I sent her. I know, I could have picked a more famous site to use for the backdrop, but I thought she would appreciate having her book shown at the first hospital built in Paris. Anyone could recognize the Eiffel Tower or the Arch de Triumph. I picked an historic woodcut in a hospital! We'll see if she puts up the picture of my husband in front of the Pont du Gard. He's an engineer, so we picked that to reflect his personality as well. Thanks for stopping by and keep checking because I have so much more to share - pictures and stories.